You’re looking at divergent ways to produce a small crossover SUV: the boxy and unpretentious Suzuki Vitara in updated Series II guise versus the uncompromising Toyota C-HR, with slinky silhouette and sleek body sculpting to make it as ‘un-Toyota’ as possible. Despite the different approaches from each Japanese brand, the target demographics are similar. Demand skews to youthful buyers upsizing, and older buyers downsizing, and few in between. Naturally, it’s a diverse segment out there. Other options to consider include the Mazda CX-3, Mitsubishi Eclipse Cross, Nissan Qashqai, Honda HR-V, Subaru XV, Hyundai Kona, Holden Trax… We could go on. While admittedly a high proportion of buyers opt for entry level, two-wheel-drive versions at sharper prices, we’re testing this pair in their flagship forms. It’s the Vitara Turbo AllGrip AWD at a list price of $33,990 and the C-HR Koba AWD at $35,290. Common equipment to both includes a proximity key/button start system, satellite navigation, Bluetooth/USB, climate control, leather on the seats, voice control, seven airbags, LED headlights, and rain-sensing wipers. Safety-wise, both get autonomous emergency braking, blind-spot monitoring, lane-departure alert, forward-collision alert, reversing camera, rear cross-traffic alert and active cruise control. The full shebang, then. The Suzuki alone gets good extras such as Apple CarPlay and Android Auto compared to the C-HR’s less user-friendly Toyota Link in-house app system, a panoramic glass sunroof and a speed-limiter. On the other hand, only the Toyota gets heated front seats, dual-zone climate control rather than single-zone, and active high-beam headlights that detect oncoming vehicles and flick to low beam (most of the time). Given the Suzuki is $1300 cheaper, it takes the edge in this part. The interior layouts and designs are as divergent as the exteriors. The Vitara Series II update adds some nice squishy plastics atop the dash, while the door cards and lower dash materials remain hard to the touch, but conversely simple to clean and hard-wearing. The seats are inlaid with suede and have leather on the bolsters, and the same material sits on the armrests and centre console cover. The steering wheel is also lovely to hold and has a very simple and ergonomic button layout, while there’s a new digital trip computer screen in between the funky analogue gauges. Still no digital speedo however. The centre stack is finished in shiny black plastic that acts as a magnet for dust and fingerprints, and is highly reflective in the summer sun – not helped by the annoying flimsy soft fabric cover for the massive sunroof that is a standard feature. That’s not good enough for a hot climate. The 7.0-inch touchscreen below those cool round vents and analogue clock is the same basic unit as the Swift’s and commendably offers both sat-nav and Apple/Android phone mirroring, though I found the CarPlay system a little prone to glitching and not recognising my iPhone X. The Bluetooth phone quality was infinitely better than the rubbish Toyota system, as was the voice control (either proprietary or the one relaying Siri). Under this screen is a simple knob-and-button operated climate-control system, and a two-tiered storage area. More importantly, the driving position and seat/wheel adjustment, and knee space, are all fine. The only downer is the headroom-restricting sunroof, once again. The Toyota C-HR’s interior is more ‘premium’ than the Suzuki, and has a more contemporary design, with a lower seating position, higher transmission tunnel, sweeping horizontal dash design, and the sort of high-end tactile finish we’ve seen carried over to the new Corolla. There’s no small SUV in this price band with a ‘nicer’ interior design. Small but welcome touches include having four one-touch up/down windows, an electric parking brake with Auto Hold, padded leathery surfaces on touchpoints, and modern-arty door designs that are quite unlike any other car’s I can think of. Typical Toyota build quality too. On the downside, the 6.1-inch touchscreen is quite small and curiously retrograde for a youthful car, the Bluetooth phone sound quality is poor, the door bins are small, and the push-in glovebox opening mechanism fails to work if the storage area is full. There is also the not-inconsequential lack of rearward visibility thanks to the enormous C-pillars and slim rear-side windows. The price you pay for design: backing out of a driveway requires judicious edging. While these cars are both largely focused on so-called empty-nesters, back seat room must be graded anyway. Alas, in both it’s a clear afterthought. You would think the boxy little Suzuki would be superior, though that’s before you realise it is 140mm shorter in the wheelbase (and almost 200mm shorter overall – it’s rather tiny actually). So, while the side windows let in more light, there’s actually less legroom and headroom, the latter down to that sunroof once again. Of course, two smaller adults will be fine, as will a couple of kids (both cars have all the requisite top-tether/ISOFIX anchors and upper points and rear-side airbags). Getting into the Toyota’s back seats is challenging, since the car is lower, the doors are smaller and the roof line sculpting juts downwards. Naturally, you’ve also got next to no outward visibility, which makes it feel claustrophobic. However, the low-slung back seats are supportive, and the scalloped roof and high-mounted front seat bases mean anyone 180cm or under actually has acceptable head, leg and shoulder room. It’s quite deceptive and a surprising outcome. Don’t judge a book by its cover yada yada. Neither of these is as practical as a Skoda Fabia wagon or even a Volkswagen Golf, though each offers cargo space about the same as most small hatches: 375L for the Vitara and 377L for the C-HR. Both also have space-saver spare wheels mounted under the loading floor, and back seats that scrunch downwards and fold mostly flat into the floor. The win here goes to the Toyota C-HR, with those caveats cited. Both cars here have small turbocharged petrol engines, though lower grades of the Vitara have a naturally aspirated 1.6 petrol. Any diesel? Nada. The C-HR’s is a diminutive 1.2-litre unit making 85kW of peak power and 185Nm of maximum torque from low in the rev band, as is typical of these sorts of units. It’s matched with a CVT automatic (with seven manual ‘ratios’ programmed in). Toyota claims combined-cycle fuel economy of 6.5 litres per 100km running on 95RON premium unleaded. We averaged a little above this. By comparison, the Vitara sports a 1.4-litre unit making 103kW/220Nm, and is matched to a conventional six-speed automatic gearbox with a torque converter. The claimed combined-cycle fuel consumption, again on 95RON fuel, is 6.2L/100km, which we matched on a drive loop. The other important driver of performance is weight. The Suzuki is a featherweight at 1260kg with liquids, whereas the Toyota tips the scale at 1510kg thanks to its heavier suspension and presumably elements of its construction (and bigger dimensions). 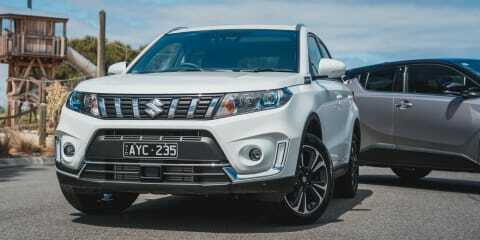 Thus, the Suzuki has 18 per cent more power and 16 per cent more torque, yet weighs 17 per cent less than the Toyota. Small wonder it’s appreciably punchier off the line and offers superior rolling response. The C-HR’s drivability is adequate, while the Vitara is actually quite sprightly. The Suzuki Vitara wins here. Here’s where the C-HR claws back. And it’s no Steven Bradbury win, because the lightweight Vitara is quite nimble, with car-like directional changes and super-direct steering. It also offers quite assured ride comfort over corrugations despite the sporty wheels and slim rubber it wears. It also has a more advanced AWD system that acts on-demand by shuffling torque rearward when the computer brain notices the front wheels are slipping (opposed to a Subaru XV’s that is always on), and adds modes that adjust the throttle mapping and stability control contingent on surface, and a Lock mode that fixes torque distribution longitudinally. It’s actually surprisingly good off-road, with hill-descent control for novices and the ability (despite lacking low-range gearing) to go quite far along some tough trails. It’s no Jimny, but it’s right up there in its class! Of course, the number of buyers who take these things off-road is tiny. The C-HR sits upon the same TNGA architecture as the Corolla and Prius, and unlike the Vitara sports expensive double-wishbone rear suspension. 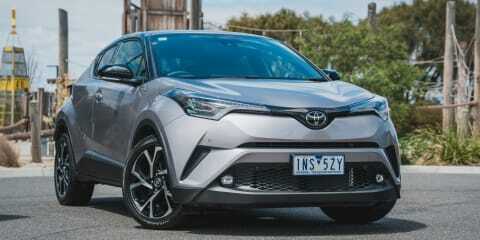 Toyota wants its new cars to handle well, as the C-HR’s tiny 150-ish millimetres of ground clearance attests. The C-HR quite simply has the best ride quality in its class, ironing out corrugations and speed bumps despite having even larger wheels than the Suzuki (18s versus 17s), while also feeling unusually agile and composed against cornering forces, and keeping noise and vibration levels from outside to a minimum. Its engine is anything but sporty, but the dynamic performance makes up for it and subsequently lives up to what the sheetmetal promises. One thing I’d add is that the C-HR in front-wheel-drive form for $2000 less makes infinitely more sense, since it’s lighter as well. Ditto the Vitara probably, though that car does suit a more rugged image and may be purchased by people going camping etc, so it’s a different case. The Toyota C-HR takes out this area, unless you explicitly like going off-road. Both cars here offer five-year warranties, though the Suzuki’s is contingent on you servicing your car at one of its dealers. Otherwise, it reverts to three years. The Toyota cover has no distance limit, while the Vitara’s is 140,000km. The Suzuki’s servicing intervals are every six months or 10,000km (whichever comes first), with the first six visits currently advertised at $175, $175, $175, $359, $175 and $379. That’s $1438 over three years. The Toyota’s intervals are a more generous 12 months or 15,000km (another advantage of this new-generation platform), and each of the first five visits out to 75,000km costs $195. So, the running costs should be a little lower. Toyota, as the market leader, also has a much wider dealer network. Both of these cars are supposed to be ‘fun’. As such, the C-HR has a vast array of different wheels, skirts, racks, and colours to pick from. Ditto the Suzuki, which despite coming in boring Cool White paint as tested, can also be had with various bright colours and with a contrasting black roof. I think you can mount a strong case that both of these vehicles make more sense in lower grades, with list prices starting in ‘2’, and in front-wheel drive. However, they’re each very likeable in their own ways. The Suzuki pairs rugged styling with genuine soft-roading ability, and has a superior drivetrain to the C-HR while probably shading its value-for-money proposition. It’s also got unpretentious charm on its side, if such a thing can be quantified. But the Toyota offers a better interior design (outward visibility aside) with surprisingly decent roominess, class-leading ride comfort and sharp Toyota running costs. Plus, if you like the design, there’s very little else out there like it.